Clyde View Holiday Park is situated on Corrigan’s Beach, however we also have a modern, child friendly swimming pool area. The pool features a beach style entrance at one end for easy child or wheelchair access, and two large ledges at the deep end, again for easy access and exit. Two mushroom shaped water fountains provide a fun area for children to play under, whilst lounge chairs have been incorporated for adults to sit back and relax on while watching their children play. A smaller amenities block is located next to the pool with toilets, showers, change rooms and disabled facilities. 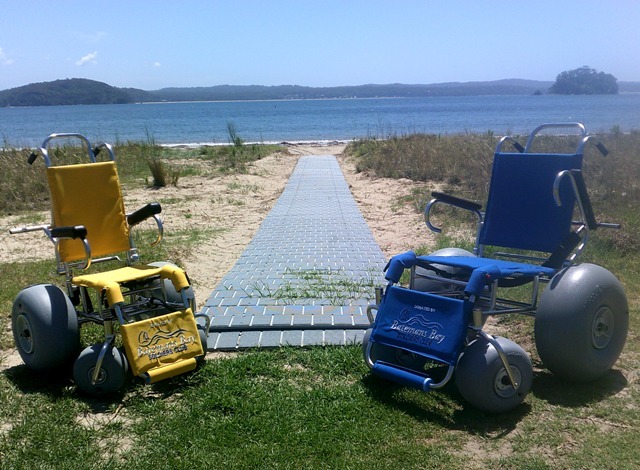 2 Beach Wheelchairs are available for hire – see below for further information. Daily: 8:30am to 7:00pm (9:00pm during peak season). 2 Beach Wheelchairs are available for hire from Clyde View’s Reception between 8.30am – 7pm 7 days a week. The chairs were generously donated to public by the Batemans Bay Soldiers Club as part of the mission by The Bay Push to provide an accessible holiday destination to all. Clyde View Holiday Park houses and manages the hire of the chairs and took part in the sponsorship and installation of the accessible boardwalk laid in front of the park providing access over the dunes to Corrigans Beach. There are also accessible playground facilities installed in the adjacent Corrigans Reserve which were part of the mission by The Bay Push. There is one Child size and 1 Adult size chair which can be hired by guests or any members of the public to be used on Corrigans Beach or in the park’s pool facilities. Please contact Clyde View on (02) 4472 4224 to book in advance or for further information.